What amazed me about the Giza plateau was that, one, it is so large. Two, that there is so much stuff out there. And, three, that there is so much bloody sand. Sand is the enemy from an excavators perspective. Dig it out and it blows back, seemingly the next day. 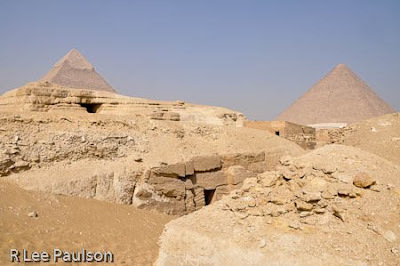 There are remnants of other pyramids built out here, tombs of all kinds, all piled up on top of each other. Notice the sand on the left creeping back into be rebury what has been so carefully excavated. Notice all the different depths of erosion on this structure. 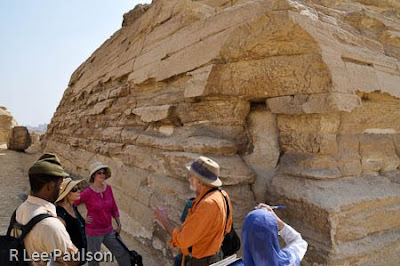 It is easy to tell the parts of the structure that were exposed the longest. This is remnant of a smaller pyramid build after the big three on the plateau. This one has most of its limestone casing still in tact. Here, West is showing us a corner where the limestone has been broken away to show the blocks underneath. The still intact sides of this structure show what the sides of the great pyramid would have looked like had the limestone casing stones not been quarried off of it. Here is also yet another case of severe wind erosion. Another half reburied tomb. 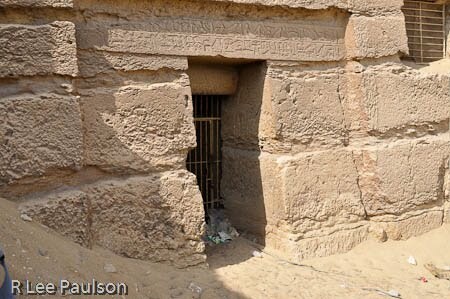 Notice the hieroglyphs over the door. Notice also the garbage next to the iron gate preventing entry. Where they haven't installed gates like this, squatters have set up shop inside and dumped mountains of garbage and human waste in the unsecured structures. 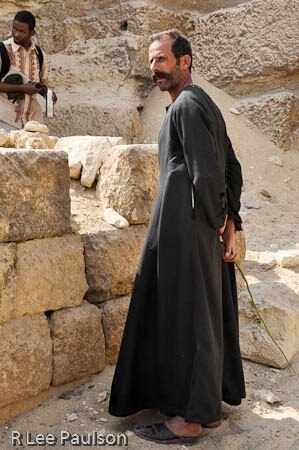 We saw plain clothes Egyptians like this nearly everywhere we went. I am unclear if they are paid to patrol the area or if they simply set up unauthorized shop in an area and then demand payment (bribes), locally called baksheesh, from tourists who inadvertently break a real or imagined rule. 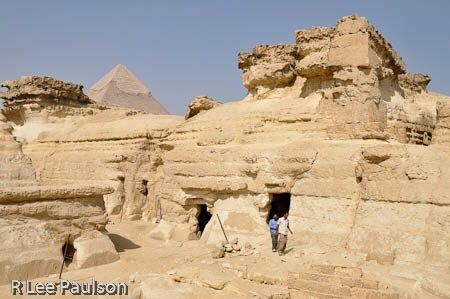 The second largest pyramid on the plateau. Sadly, they do not allow entrance into this one. These are just a few of the huge numbers of tour buses that descend on the plateau every day. In front of the above pyramid, whose blocks can be seen on the right, notice that it looks as though we are standing on bedrock. But, we are not. Notice the line just in front of Mike's feet, then follow that line to the left, back to where West is standing. 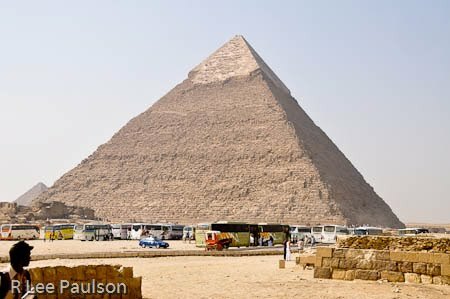 That is, in reality, one huge block of limestone that was used as a base for this pyramid. 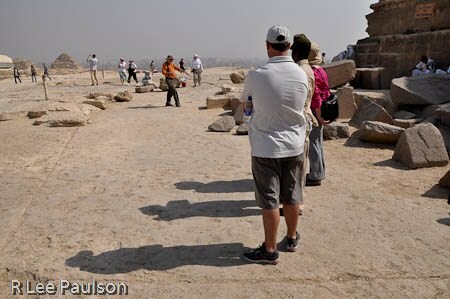 The entire area was paved with these huge, 200 ton blocks, that we are able to move only with great difficulty today. 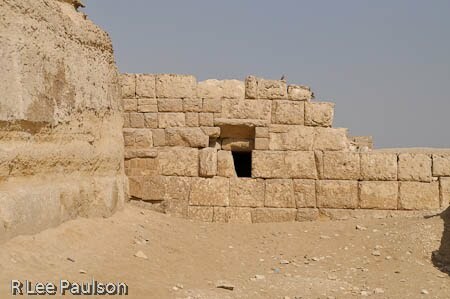 Here is another example of the two distinct building styles and therefore, we presume, two different periods of building. West claims these huge blocks, casually placed the way they are, is more evidence of a "lost civilization". From all appearances, these huge blocks were placed as casually, and perfectly, as one might lay smaller paving stones today. Notice the tourist police sitting in the shade, just to the right of Melony in his white uniform. Notice also the rope behind west. Technically, we are standing inside the rope and are not supposed to be inside where we are The guards came to shoo us away, but Suhaila yelled back at them, saying that we were doing legitimate instruction here. If they were so intent on keeping folks from behind the rope, why had they not thrown out the guys to the left of them, who were fighting and quarreling amongst themselves? One must assume that baksheesh was involved. After retreating from Suhaila's threats, the policemen retreated back to the safety of the shade and left us alone. This post may take a bit longer to load than the others. Sorry about that. I felt that you would be interested to see this last shot, though. 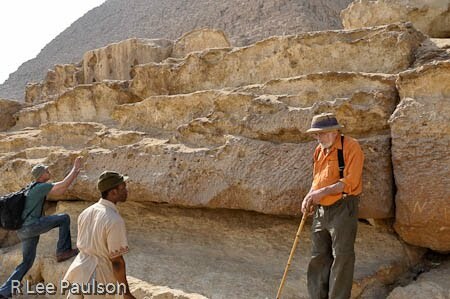 This is the edge of those huge blocks shown above, with the pyramid above. Continue on to Post 7: Solar boat of Khufu by clicking here.